It was yet another cloudy day for this linear walk from Chelford to Holmes Chapel. With a 10 am start, fourteen ramblers headed off south from the village following field paths on what was to be a fairly mild day. A road was briefly joined through Peover Heath before returning to field paths. With little recent rainfall, the walking was firm underfoot with few muddy areas. A morning break was taken near to Foxwood Farm. The farmhouse is grade II listed and has a plaque over the door stating the date it was built and by whom. Nearby, Jodrell Bank Telescope was always a dominant feature on the landscape, and during our walk the dish slowly tilted. Later we made a small diversion to view the outside of Toad Hall which is believed to be the oldest building in the parish of Goostrey. It is now joined by the Old Medicine House, a timber framed building which originally stood in the village of Wrinehill near Crewe and was moved during 1970 to this location and rebuilt brick by brick. The owner’s wife gave us a brief history of the place. (hopefully we can arrange a couple of group visits in the summer – watch for details). The churchyard at Goostrey was our lunch stop where there were ample seats for everyone. St Luke’s Church nearby is grade II listed and the former church was in existence prior to 1244AD. The original church was timber framed, but this was dismantled in 1792 and the present church built between 1792 and 1796. 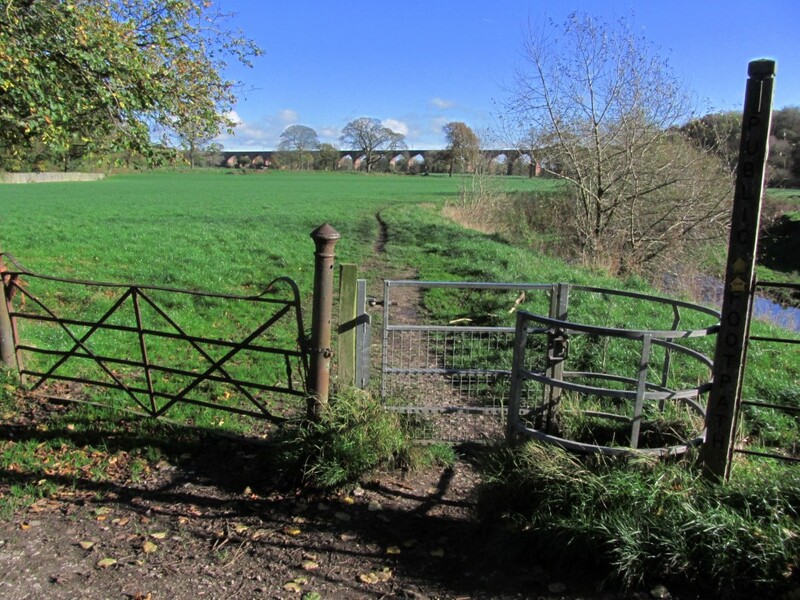 For the afternoon, it was a relatively short walk across fields to Holmes Chapel and crossing on the way the historic Hermitage Bridge which dates from 1772 and spans the River Dane. Today the bridge was in the process of being re-pointed. In Holmes Chapel we all managed to squeeze into Cobbles Tearooms for afternoon refreshments before wandering down to the railway station for the train back to Chelford. The Dane Valley at Hermitage Bridge. Picture taken on a sunny day in November 2014 as today was so dull.